Um? Not too sure anymore..... 17,000km since leaving Australia though!! Well, made it into the land of the beautiful, so they think anyway! Just been wondering the streets of Stockholm and the girls havn't got any uglier since my last visit! Did some shopping (cryptic clue for those in the know!). Nice weather here, about 15 degrees today, feels like summer after Rovaniemi. 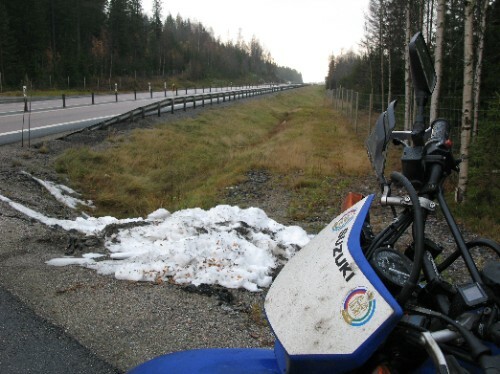 I rounded the Gulf of Bothnia without any problems, althought the DR hated the cold weather, kept getting a big flat spot whenever I'd back off for the 80kph zones. I pulled over and let it idle for a bit and it the problem would disappear, maybe the carb freezing? Not sure, couldn't see much and didn't stop for too long incase I froze to death. Hell of a ride. Two and a half days of thick fog made it interesting.... Once the fog lifted it was a really good ride, heaps beautiful country Sweden! Wasn't really expecting too much, I really just wanted to get here and had stopped enjoying the ride for a bit, but once that fog went away I was wishing for a few more kms of road before Stockholm! It's actually getting a bit like that now. 600km or so to go until Copenhagen and then its over, really over. Can't beleive it. I, of course, am really looking forward to seeing Renee in Copenhagen. There'll be a hell of a party, you lot should come over! Thanks to everyone for the posts on the message board, keep them coming. And most inportantly remember to STAY TUNED because its not over yet!! There is a final twist to this little adventure that will be revealed in Copenhagen........... Love a mystery!